The Digital Planetarium is located in hall 16. For more program details please look at monthly program . All fulldome films and the live show are presented in German. However, all fulldome films are also available in English; most of them are also available in various other languages (see matrix). Visitors who purchase planetarium tickets can also rent audioguides, which allow to listen to the respective shows in one of the available languages by using headphones. Please inquire at the information counter for availabilities. We regret that live shows are only available in German. 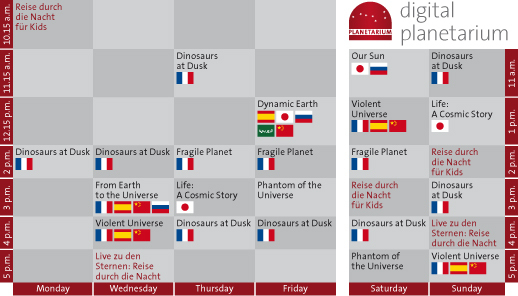 In addition, groups can rent the whole planetarium for foreign-language fulldome shows; please contact anmeldung@nhm-wien.ac.at for details. Tickets for the planetarium are available at the information desk or online. Every fulldome show (except Dinosaurs) is preceeded by the short 6 minute film Loosing the Dark. Journey Through the Night for Kids is a new live show at the NHM Vienna. Therein, astronomers explain the topics of space travel, astronomy, and space research in an easily understandable and child-friendly way as an exciting virtual adventure. In the most modern planetarium in Austria we will experience a real rocket launch at close quarters, land on the Moon, accompany a space probe on its journey through space, and push ourselves to the limits of our imagination. We will learn what stars are made up of, if we could breathe the air on other planets, how long it takes to travel to Mars, and much, much more. The virtual adventure is complemented by an exhibition of space objects in front of the planetarium. Exhibits on display are including an Austrian flag flown to the Moon, a real piece of lunar rock, and the original space suit worn by astronaut Franz Viehböck  the only Austrian to have been in space. Astronomers show the current night sky and take you on a trip to various extraordinary places in universe, such as the rings of Saturn and Jupiters moons. Leave our solar system and pass the stars of the Milky Way at the speed of light or even faster! You will learn what is are actually visible on the night sky above Vienna, you will visit some selected objects and you will learn about actual space missions to some of these objects. Phantom of the Universe shows the exciting exploration of dark matter, from the Big Bang to its anticipated discovery. It reveals the first hints of its existence in the 1930s through the eyes of Fritz Zwicky, the scientist who coined the term "dark matter." It plummets deep underground to see the most sensitive dark matter detector on Earth, housed in a former gold mine in South Dakota. From there, it journeys to the Large Hadron Collider, the worlds largest and most powerful particle accelerator at CERN (Switzerland), where scientists from all over the world are collaborating to track down the constituents of dark matter, a type of matter that has not been directly observed yet but the existence of which is not called into question by cosmologists nowadays. To answer this basic question the show begins in a redwood forest, with the sounds of wind and life. One redwood looms large, until we approach its branches and enter one of its leaves, adjusting our perspective to microscopic scales inside a cell. We see a pared-down version of its inner workings, learning about the process of photosynthesis and the role of DNA. This scene sets the stage for the story of life. ORIGINS OF LIFE deals with some of the most profound questions of life science: the origins of life and the human search for life beyond Earth. Starting with the Big Bang, in chronological order, the show deals with the prebiotic chemistry in the Universe, the formation of stars, formation of solar systems, and the first life on Earth. Furthermore ORIGINS OF LIFE covers the great extinctions as well as our search for (primitive) life beyond planet Earth. Now in more than 70 planetariums worldwide, DYNAMIC EARTH explores the inner workings of Earths great life support system: the global climate. With visualizations based on satellite monitoring data and advanced supercomputer simulations, this cutting-edge production follows a trail of energy that flows from the Sun into the interlocking systems that shape our climate: the atmosphere, oceans, and the biosphere. This show is an entertaining and educational fulldome experience for the whole family that tells the fascinating world of trees. THE LIFE OF TREES shows the importance of plants for life on earth, how trees grow, how they transport water against gravity to the top of the crown, and enabled diverse life on earth by producing oxygen. FRAGILE PLANET gives audiences an astronauts view of Earth, highlighting Earths unique regions. The journey then continues to the Moon, Mars, and beyond the Milky Way to search for habitats that might host extraterrestrial life. The shows theme  that Earth is the only known haven for life, and thus is important to protect  echoes the themes of biodiversity and sustainability. A learning adventure of a father and his teenage daughter Lucy, who share a fascination for all things that fly. Youll travel back in time to meet the pterosaurs and the ancestors of modern-day birds: the feathered dinosaurs. Lucy and her father navigate from continent to continent, looking for clues about the origins of flight. When time runs out they experience first-hand the cataclysmic last day of the dinosaurs. Science content includes topics such as continental drift, proper motion of stars, asteroids and impacts, extinctions and the convergent development of flight among species. The scene was 74,000 years ago, on the island of Sumatra. A volcanic eruption triggered the sudden and violent collapse of a vast regional plateau. Toba, as the volcano is known today, was the largest volcanic eruption in the last 25 million years. But Earth has seen far larger. 250 million years ago, an eruption in whats now Siberia lasted a million years and was probably responsible for the greatest episode of mass extinction in Earths history. Watch comets, asteroids, and meteors hurtling through space. Stars collapsing under their own gravity. Infernos of nuclear energy releasing their deadly radiation across the universe. Witness the raw power of the cosmos in this thrilling show that gives you a front-row seat to watch as worlds collide! A journey to the origins of space and our life. The show tells in breathtaking pictures the story of the genesis and the evolution of the universe and our world  from the big bang until today. A philosophical approach to the origins of space and our life, this animated full dome production is designed in any aspect for the immersive theater  a completely new dimension of filmed visualisation. The spectacular full-dome film Journey to a Billion Suns was produced in cooperation with ESA and planetariums across Europe on occasion of ESAs Gaia mission. It tells the fascinating story of mapping the Milky Way, from ancient times to the 21st century. During its five-year mission Gaia is going to measure the positions, motion, and physical characteristics of a billion stars to create the most accurate 3D map of our galaxy, the Milky Way, ever made. The mission follows a long tradition of star mapping, dating back to the ancient Greek astronomer Hipparchus who, in 129 BC and using only naked eye observations and simple geometry, catalogued the relative positions of around one thousand stars and thus laid the foundations for investigations of the Solar Systems place among the stars for the next two thousand years. Now, Gaia will take our understanding to a whole new level.